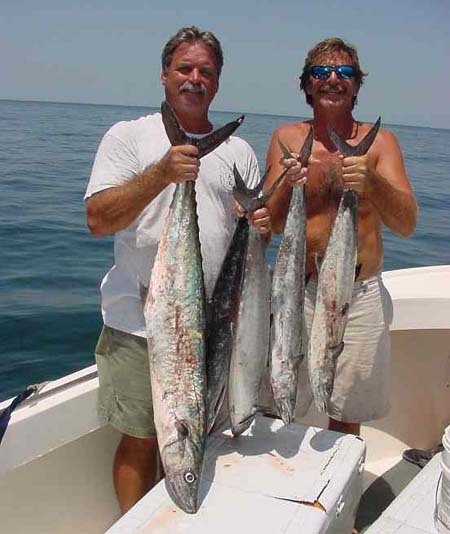 This is when almost all of us can take advantage of the Kingfish action that North Florida has to offer. When the kings move in to the close in reefs (reefs, that are within 10 miles of the beach), most of us with seaworthy boats can catch our share. 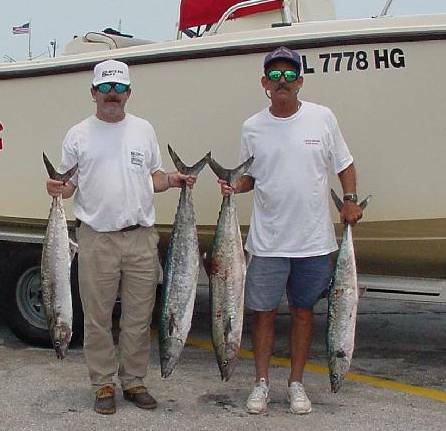 Here is how you can live bait fish for your share of these fish and the equipment that, I CONSIDER A MUST to venture into the ocean. (2) when fog rolls in so thick you can fillet it, the GPS will get you home again. The compact GPS module plugs into your Tournament Champion NCC 6500, Tournament Master NCC 5300 or Tournament Master HR and lets you navigate through the large screen of your fish finder. Its continuous 12-channel satellite tracking not only keeps you constantly aware of your current position, it keeps track of where you've been and where you're headed. Its powerful satellite receiver is small enough to mount unobtrusively anywhere in the boat. Some sort of direction finder, a GPS or DGPS. To find your way around in the ocean and be able to find the wrecks you have to have some sort of machine that will show you where you are and where you are going. Before you head to the ocean for the first time with your new GPS, test out it's ability to perform. Go into the river and save some waypoints such as channel markers. After you have saved these in your new machine, go several miles away from the stored waypoints and see if the unit will take you back to the marker. If you have plugged in the correct numbers in the machine and it will not take you back within 50 feet of the marker, then you need to take that one back and buy another style. Now that you have your new unit and you are sure that it works, you will need to purchase some sort of map, like the Jacksonville Offshore Club Map. This map will have all of the coordinates for these reefs and it is a map with compass headings to and from the reefs. The reason that I like a map, as opposed to just a book with numbers in it, is, if your direction unit goes down you will be able to see where you are and you will have a compass heading back to the inlet. You must have a compass. One mounted to the boat, not a hand held model. Lets spend some more of that money that you have worked all week to earn. You are now going to need some sort of fish finder. I have a BottomLine that is a great fish finder. It is water proof and Jim proof, shows a great picture, has GPS capability with plotting and navigation features. The Tournament 5100 not only shows you bottom contour at a glance, it gives you a big, bold readout displaying water depth and recent history. The split-screen feature of the Tournament 5100 gives you the normal view on the right, while a zoom display on the left clearly separates fish from the bottom of the lake. You have spent thousands of dollars for a rig and the fish finder is your underwater eyes. The $99 units are fine for some applications but in the ocean you need a unit that shows a crystal clear picture and has some nice features like the Bottomline. Okay, we have our new directional unit, our map that list all of the placements, we are almost ready, or are we. Now for the safety equipment. Be sure that your bilge pump works, or better yet, install a second, much larger pump, wired to a separate switch. Next to your boat being on fire, sinking is the next worse thing that can happen to you. Have you checked your fire extinguisher lately? Take this out of the hole or compartment where it has been stored and check it, or better yet go to S.A.F.E. located at 5863 W. Beaver St. in Jacksonville or call them at 695-4200 and maybe they will come to your boat and give it a safety inspection. These people have been in the fire extinguisher business for a long time and they are experts in putting out fires. Having your family in the boat that is on fire and you do not have the proper fire extinguisher to put out the fire is just plain dumb. Most of the time a quality extinguisher can be purchased for under $100.00, this is a small price to pay for the protection that it will provide. Call the guys at S.A.F.E. and have them fix you up, protect your family and yourself, don't be cheap, when it comes to being able to put out a fire on your boat. It is not like you can run outdoors and watch it burn from your yard, you will have to get in the water, with the sharks and it's a long swim back to the dock. Be sure you have life jackets, flares, a horn or whistle, a good first aid kit, a good waterproof flashlight and a VHF radio that has at least enough range to reach out and contact someone if you need help. Now that you have the boat ready, lets talk about the rods, reels, line and rigs. I like a very soft tip rod about 7 to 8 feet in length, a reel that has level wind with a 3.8 to 1 or better retrieval rate and will hold at least 300 yards of 20 pound test monofilament. Here is one of the rigs that I use. Shakespeare Ugly Stik Tiger Rod BWC 2200 7' ML with a Shakespeare Tidewater TW 30 LA Reel or TW 50 LA Reel. Both of these reels will hold at least 300 yards of 20 pound test and the rods will be some of the finest that you have ever fished. Live bait rigs consist of 20 to 30 pound coffee colored wire, a small barrel swivel, a couple of Daichii 2 to 4x, #4 treble hooks and if you like, some sort of skirt. If you have not been able to tie your own rigs, then you can purchase them from several tackle shops here locally such as Clapboard Creek Fish Camp on Heckscher Dr. Even if you might think you can tie one of these and you are a novice, go and buy one or two so you can see exactly how there are tied. You can run down the beach until you see fish flipping on the surface (look for the pelicans diving). When you see these fish, ease up to them and toss your Fitec cast net over the school. I like the Fitec Pro Selecte Series in a 8 to 10 foot size with a 3/8 inch to 1/2 inch mesh. GS 1500 Series(Pro Selecte' Series) Go right to the live well with your baits and you are now ready to head for the kings, or you can purchase some Daiichi Bleeding Bait Sabiki Rigs Bait Rigs With Gill FlashTM, and go to the area that you intend on fishing and jig up all that you want. Catching the bait on Sabiki rigs is very simple once you have found the school. Tie on the rig to a rod and reel, like a big spinning outfit, send it down to the bottom and start moving the rig in an up and down jigging motion. When a fish gets on, wind the rig back to the boat and in the live well with him and back down for more. Bring more that one Sabiki rig, as big fish will sometimes eat the small fish before you get him up and you will lose the entire rig. Once you have about 50 to 100 baits you are ready to King fish. Get the boat going about 1/2 to 1 mile per hour and start sending the baits out behind the boat. If you can afford to purchase a downrigger or better a set of them, you can fish your baits at different depths. Cannon has been in the downrigger business for a long time and makes several styles to choose from. These are almost as important as BAIT. Send at least one bait down on each of these to different depths. I like one down about 3/4 of the way to the bottom and the other about 1/3 of the way to the bottom. The other three or four baits should be staggered at different distances behind the boat. If the baits are being drug on their sides then you are going too fast. They need to be swimming. You can slow the boat by dragging a 5 gallon bucket or spending some more money and purchasing a sea anchor. When you get a fish on, it is a good idea to get all of the other baits OUT OF THE WATER. Until you get a crew that works like a is the team, this best way to insure that the fish on, makes it's way to the box. While fighting the fish remember, the hooks are not very big and do not get a good bite in the fishes mouth, so be gentle with the amount of drag that you apply to the reel. You do not want to lose your fish because your drag was too tight. Keep steady pressure on the fish as you angle him. When he gets along side of the boat, put the gaff under the fish and with one motion come up with the gaff and in the boat with the fish. This can be a dangerous way to fish if you are careless. The hooks are very sharp and will penetrate your flesh very easily, the fish have razor sharp teeth and watch the gaff as you swing it around the boat. When you gaff a fish, go straight to the box with him, don't let him flop around on the floor. After you put the fish in the box shut the lid and take the rig off of the fishing line. DO NOT try to get your rig out of his mouth while he is still alive. You will end up with a hook in you or you will get bit. Wait until he is dead, then the rig will come out easily. If you have never been in the ocean when an afternoon thunder storm comes through, then good for you. For those of us that have, we can appreciate being back to the dock after the encounter with this dangerous situation. My rule of thumb for small boats or novice offshore anglers is: Get an early start and be back to the dock by 2:00 or 3:00 in the afternoon. If you follow this rule, your chances of having to deal with one of these violent squalls will be greatly reduced. If by chance you do get caught in one of these white knuckle rides, keep the boat pointed into the waves and DO NOT panic. If you have a seaworthy boat and you are a good skipper, you should be able to ride it out. Remember, the ocean can be a great deal of fun or she can swallow you up like you never existed. If you are going to venture into the ocean, do it with respect for her. These kings with Mark Williams, Alex Thomason and Eddy Smith were the results of trolling within sight of land out of Jacksonville.